Blocks are components that represent a subset of the groups found within Form. For example, the size of particles, the color of the particles, and the Particle Type are all components of Form represented by Blocks in the Designer. To begin, access the Blocks pane in the upper right corner of the Designer. Move your cursor over the word Blocks (or the area immediately to its left). This will open the Blocks pane in Unlocked mode. This means that if your cursor goes back to the left side of the Designer interface, the Blocks area will automatically close. You can click on the arrow beside the word Blocks to put it in Locked mode so it stays open. Click the arrow again to put it back into Unlocked mode. 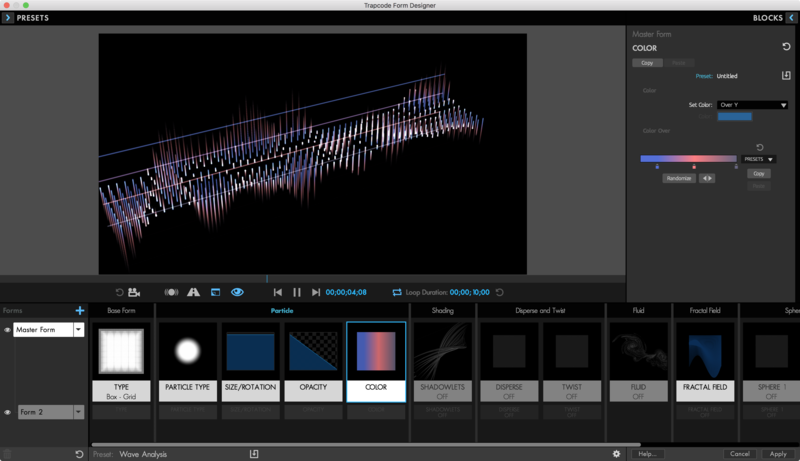 The pane contains eight sections of preset Blocks divided up into categories that correspond to the groups and sections of the main Form user interface in After Effects. Base Form: The Base Form Blocks control the shape of the particle structure. 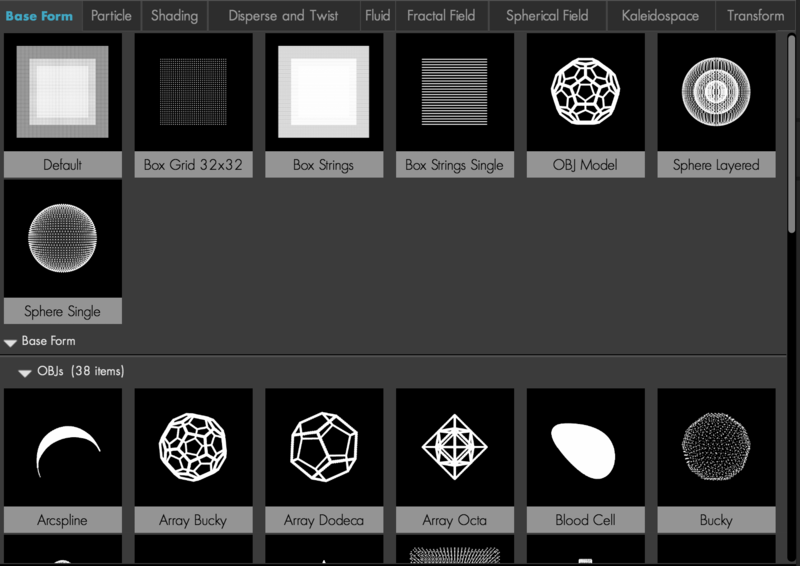 The Designer has Base Form presets to choose from, including 3D OBJ models. Learn more about Base Form on the Base Form controls pages. Particle: The Particle Blocks determine what the particles will look like. The Designer has a block for each Particle Type. Learn more about particles on the Particle controls pages. Shading: The Shading Blocks allows you to apply Shadowlet Blocks which will interact with any lights that you have setup inside your AE comp. Learn more about Shadowlets on the Shadowlet Group page. Disperse and Twist: Contains several options (in the form of Blocks) for dispersing particles at different settings, as well as several different Twist options for twisting the Base Form. For more info on Disperse and Twist, see the Disperse and Twist page. Fluid: Give your particle form the appearance of fluid with an array of fluid blocks that'll apply fluid dynamics across your effect. Learn more about fluid dynamics on the Fluid Group page. Fractal Field: The Designer contains several different varieties of Fractal Field distortions that you can apply to your particles to transform their form. Learn more about the Fractal Field on the Fractal Field Group page. Spherical Field: Creates a spherical distortion that transforms your form. There are two separate Spherical Fields you can use, and the Designer contains two preset Blocks for each. Learn more about the Spherical Fields on the Spherical Field Group page. Kaleidospace: Mirrors the form particles to create symmetry. Learn more about Kaleidospace on the Kaleidospace Group page. World Transform: Controls basic properties such as Offset (movement), Scale, and Rotation of the whole form structure. Learn more about World Transform on the World Transform Group page. The Base Form Blocks are divided into 2 different sections. The first section contains a Block for each type of Base Form. The second section contains a variety of 3D OBJ models for you to select if your Base Form is set to OBJ. Consult the Saving New Blocks section later on this page to save your own custom Base Form blocks. Refer to the Base Form controls section of the user guide for more information on how the specific controls work for the Base Form blocks. Selecting one of the Blocks in the top of this section will change the type of particle being used. 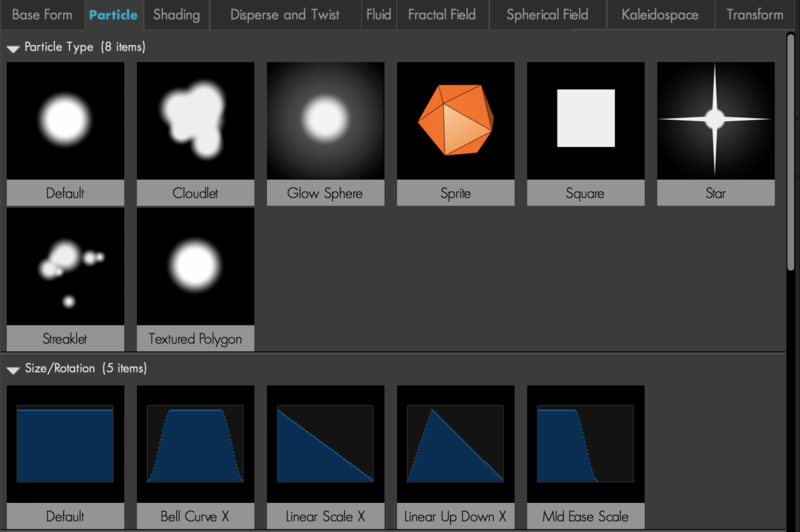 Selecting one of the Size/Rotation, Opacity, or Color Blocks will change the properties of the existing particle Block. Consult the Saving New Blocks section later on this page to save your own custom Particle blocks. Refer to the Particle controls section of the user guide for more information on how the specific controls work for the Particle blocks. The Shading Blocks allow you to add a Shadowlet to your particles. Consult the Saving New Blocks section later on this page to save your own custom Shading blocks. Refer to the Shadowlet Group section of the user guide for more information on how the specific controls work for the Shading Blocks. There are 4 Disperse Blocks and 4 Twist Blocks. You may have one from each category represented in the Effects Chain. Refer to the Disperse and Twist Group section of the user guide for more information on how the specific controls work for the Disperse and Twist values. The fluid blocks serve as great jumping off points for giving your particles the appearance of fluid. Visit the Fluid section of the guide for more information on working with fluid dynamics. The Fractal Field in Form is a great way to distort particles. This section contains Blocks for affecting the size, opacity, and displacement of your form particles with the Fractal Field. Note that applying any of the Fractal Field Blocks (aside from the Default Block) will automatically create animation unless the Flow Evolution value is set to zero. Consult the Saving New Blocks section later on this page to save your own custom Fractal Field blocks. Refer to the Fractal Field section of the user guide for more information on how the specific controls work for the Fractal Field Blocks. Form allows you to distort your base form by using two separate spherical areas. These act as invisible spheres that move your particles around. In the Designer, there are Blocks to push or pull your particles using either of the Spherical Fields. Each Spherical Field can have its own Block with its own independent settings. Consult the Saving New Blocks section later on this page to save your own custom Spherical Field blocks. Refer to the Spherical Field Group section of the user guide for more information on how the specific controls work for the Spherical Field Blocks. 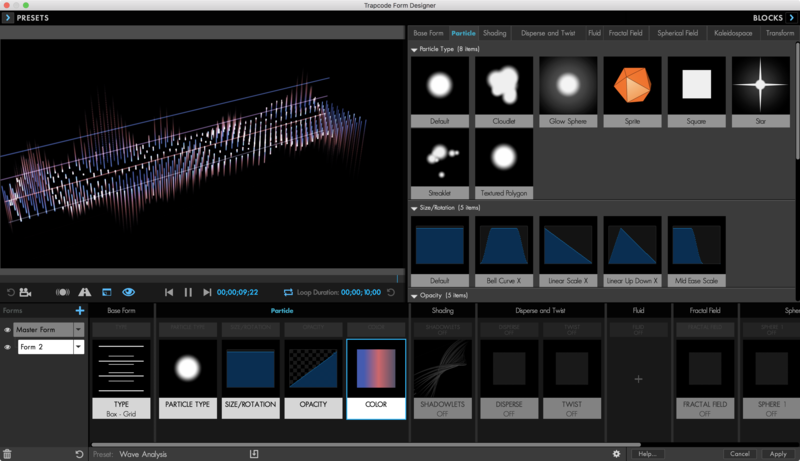 Kaleidospace Blocks allow you to create horizontal symmetry, vertical symmetry, or to reset Kaleidospace to its default settings. Consult the Saving New Blocks section later on this page to save your own custom Kaleidospace Blocks. Refer to the Kaleidospace Group section of the user guide for more information on how the specific controls work for the Kaleidospace Blocks. World Transform controls basic settings such as Offset (movement), Scale, and Rotation. By default, the only World Transform Block is Default, which allows you to reset World Transform back to its default settings. This is great for those of us that play around and experiment a little too much. Consult the Saving New Blocks section later on this page to save your own custom World Transform blocks. Refer to the World Transform Group section of the user guide for more information on how the specific controls work for the World Transform Blocks. The Form Designer includes many preset Blocks to get you started. Each Block contains its own set of controls that correspond to settings from the main Form plugin. As an example, the Base Form Block settings correspond to the Base Form group in the main plugin (refer to the Base Form section of this user guide for more detail on how these controls work). The Block Controls pane is visible when the Blocks pane is closed and a Block from the Effects Chain is selected. 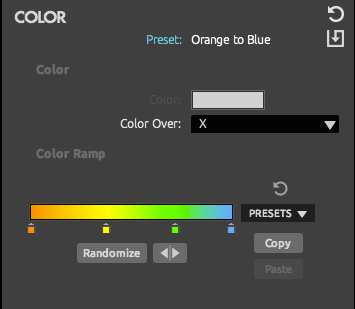 With the Color Block selected in the Effects Chain (lower left) and the Blocks area closed, we see the Block controls on the right side of the Designer interface.